Please join us at Red Pill Now for our next free webinar: Taking the Guesswork Out of Selecting a Solution for Modernizing Your Domino Applications. Join Red Pill Now’s Peter Presnell and Viktor Krantz as they discuss Take 5, our newest offering designed to take the guesswork out of selecting a solution for modernizing your Domino data. Take 5 provides a one stop test drive for the leading industry solutions for modernizing your Notes applications and critical Domino data. After discussing your business objectives and analyzing your Notes domain, we’ll provide you with a hands-on, side-by-side demonstration of up to five solutions, each developed by leading IBM Business Partners. Can modernizing your Domino applications save you time and money? Join our next webinar and we will help you answer that question – once and for all. IBM Champion, former director of the Atlanta User Group for IBM Collaboration, and architect of the .Domino framework on OpenNTF, Peter is a globally recognized lecturer, trainer and thought-leader within the IBM Notes community. As Red Pill Now’s CEO, Peter leads our market strategy and program management practice. Former Global Technical Sales Leader for IBM, Viktor joins the Red Pill Now team, leading our Take 5 program, as well as other new modernization solutions being developed by the team. Viktor’s experience coordinating over 400 people in pre-sales for IBM’s collaboration suite of products makes him an ideal fit for Red Pill Now’s rapidly growing modernization practice. 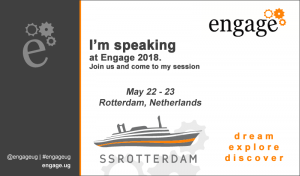 I’m humbled to report that I have been selected as a speaker at Engage 2018 in Rotterdam, Netherlands. I will have a workshop: Red Pill Now: Take 5: Modernization Workshop on Monday, May 21 together with my team at Red Pill Now. That session might include me wearing a bright colored suit. I will also co-present a session that I very much look forward to: The History of Notes/Domino and the Events that Shaped us. I’m really looking forward to Engage this year with my fellow team members at Red Pill Now. With all the exciting news that are coming out of IBM and HCL regarding the future of Notes/Domino we are entering exciting times and Theo Heselmans, the coordinator extraordinaire, always puts on a great event. Come join us!!! In January, 2018 I joined Red Pill Now as their Director of Modernization Solutions. Read more about it in this blog post. It’s that time of the year again, time for me to post an entry here on my blog because it’s time for Lotusphere again. Well, the conference has been renamed to IBM Connect, so after 12 years I now have to create a new tag for this entry. You can find the session on Vivastream. This year I’m co-presenting with Wouter Aukema of Trust Factory and I’m really looking forward to it. Many IT managers, IT architects and decision makers find it challenging to define a future social strategy among the onslaught of demands to try something else. This session will arm you with crucial information to defend years of successful investments in the IBM Notes and Domino platform, producing factual data that can be trusted. You will learn how your roadmap becomes stronger when obtaining evidence from your environment that reveals how your business is making use of the IBM Notes and Domino platform so successfully deployed. Wouter Aukema, Trust Factory B.V. I travel a lot and I use Tripit.com for all my itineraries. I also use FlightTrack Pro and it syncs all my flights automatically from Tripit. This help me keep me up-to-date with any last minute flight and/or gate changes. I use Lotus Notes as my email and calendar application on my Mac and I like having all my Tripit itineraries showing up on my Lotus Notes calendar. Today I found that I have to change the URL that Tripit tells me to use from “webcal://” to “https://” and it will work great. Stephan Wissel has already posted about our session at Lotusphere 2012 here. Thank you all for your positive feedback, it’s always fun and interesting to present at Lotusphere and this year was no different. I wanted to recap a few comments from the evaluations below. You can also see the slides below them. Viktor and Stephen always enjoyable, informative and relevant. Looking forward to Stephen’s promised blog postings! It’s that time of the year again! Lotusphere time. For the 11th year in a row I’ve been gracefully selected to speak at Lotusphere. If you need to feature Domino XPages applications in more than just a browser – for example in the IBM Lotus Notes client and sidebar, desktop gadgets, mashups, IBM WebSphere Portal, and IBM Connections – then come to this session! You will learn how to write XPages applications once and show them everywhere. Lotusphere – Business. Made Social. The premier event for the Lotus community worldwide – developers, administrators , IT and business professionals looking for collaborative software and solutions. From presentations on the latest innovations to hands-on training to interactive networking discussions, it’s all about getting the latest word on Lotus products and strategy that you can’t get anywhere else! Once again I will be going to Florida for 10 days of fun with friends from Sweden. This year we will be 10 of us watching five football games and one NHL game. We got two NFL games, including a Monday Night Football game in Jacksonville, two NCAA games and one high school game. We will also have time for tailgate parties before all the games, deep-sea fishing, Segway tour of Tampa, shopping at outlet stores in Orlando, visit the beautiful beaches of Clearwater and a tour of Raymond James Stadium, home of Tampa Bay Buccaneers and USF Bulls. Read more about the adventure here. This years tour is organized as always by Sport Tours Professionals. Brilliant video by my friend and co-worker Louis Richardson (@inter_vivos). As you look at vendors and solutions to help you become a social business, there are some specific areas you should consider. We’ve listed 3 that we’ve seen as we’ve worked with companies around the globe. After almost exactly one year my blog is now up and running again and a lot of things have happened since I last posted an entry. I have a new employer and now work as a Sr. Technical Advisor for IBM. I started back in April and my primary job role is helping customers with their XPages in Notes and Domino, Social and Mobile decisions. I worked for SNAPPS for 11 fulfilling years (about 22,000 hours) and I had a blast together with Rob Novak and my co-workers; Troy, Jerald, Julian and Melissa. Rob wrote a wonderful blog post of our years together on my last day at SNAPPS.